Today's trip was inspired by Tour No. 1 (North and West of Highway 29) of the From the Pineries to the Present series. This tour consists of 19 stops (including two optional stops and one alternative route), and covers 64.7 miles. I arrived at the first stop at in Angelica at 9:30 a.m. I left last-stop Tilleda at 4:45 p.m. I did not stop for a meal. I took nearly 500 photographs (this eats a lot of time!). Shawano County scenery is often lush and pristine. Home to the Menominee and Stockbridge-Munsee tribes of Native Americans, the lands are sacred. Shawano County is Wisconsin's Barn Quilt Capital. It boasts the largest logging camp museum anywhere in the United States. At least two Smokey the Bear "Fire Danger" signs remain intact along the highways. The towns are quaint, historic, and picturesque, the people Wisconsin-warm and welcoming. How to use this post: Scroll down to see photo(s), a brief description, and the street address of each stop. Also included is a link to a separate post that contains detailed directions (including GPS coordinates and a Google Map link), a transcription of the marker (when appropriate), and lots more photos. At the bottom of this post is a "print" button with the option to "remove photos". Feel free to print this post and use it as your guide for the tour. Click here for a printable Google Map with all locations (the letter for each stop correlates with the Google Map). If you have any questions or comments about From the Pineries to the Present, feel free to contact President Marlene Brath by e-mail. When you finish your tour, please stop back and leave a comment! We'd love to hear from you! This marker is located in Angelica. 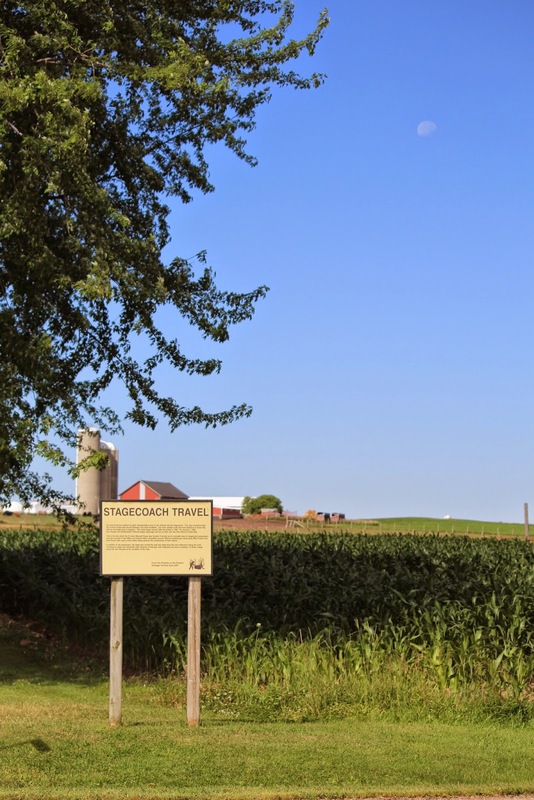 It commemorates the various stagecoach routes that served Shawano and other localities prior to the arrival of the railroad. Click here to read more. The marker is located on southbound County Road C, between Hillside Drive (to the north) and Cherry Drive (to the south), and across the road from the Angelica United Methodist Church, located at W1586 County Road C, Pulaski, Wisconsin 54162. Here we are leaving Angelica on northbound County Highway C, and along comes this piece of farm equipment. As I grew up in the highway gridlock of Southern California, I get pretty tickled seeing these machines on the roadways. They can seem like alien creatures approaching, especially the ones that are huge! If you're not familiar with driving county highways during summer months, these vehicles have the right-of-way. Fortunately, though, they don't usually go too far before they pull off. Shawano County is Wisconsin's "Barn Quilt Capital". As of June 13, 2014, there are 266 quilt barns in Shawano County. I saw a couple dozen today; photos of some are included in this post. I love the quilt barns! They're varied, colorful, and a lot of fun to photograph. I wish a knew more about the names of flowers -- everywhere I went today were carpets of color. Purple, yellow, white, shades of green. Just absolutely gorgeous! Made me think of that Dolly Parton song, God's Coloring Book . . . oh, and today's sky was sapphire blue with fluffy white clouds! I arrived in Shawano from Highway 29, and headed north on Highway 22 / South Main Street to the starting point for the tour: "Leave from Main Street Spirit of Shawano Parks." En route, I discovered the Shawano County Chamber of Commerce Visitor Center. Visitor centers are located all around Wisconsin and are chock full of helpful information for travelers, all organized by county and/or theme. This stop is optional, but highly recommended. One of the things I love about Wisconsin is the family-owned business signage! This burgers, ribs, and wings joint is just a couple blocks north of the Chamber. This building caught my eye for two reasons -- the architecture and the ghost ad on the side. I pulled over to take some photos, and discovered I was photographing the now vacant Farmers Brewing Company building. I always share these kinds of finds with Darrell Smith, President of the Museum of Beer and Brewing in Milwaukee. Farmers Brewing Company opened in 1915. Products included Farmers Lager, Shawano Pilsener, and Shawano Club Beer. The brewery was forced to close in 1920 due to constitutional prohibition, and did not re-open until 1934. Click here to read more. The building is located at 713 South Main Street, Shawano 5416. After the two unscheduled stops, I finally arrived at the starting point of the tour. These statues are located at the intersection of North Main Street / South Main Street / Highway 47 / 55 and West Green Bay Street / Highway 29 and East Green Bay Street / Highway 22 / 29 / 47 / 55 (yah, the center of town! and, yah, it's can get really confusing as to just exactly what street / highway you're on!). 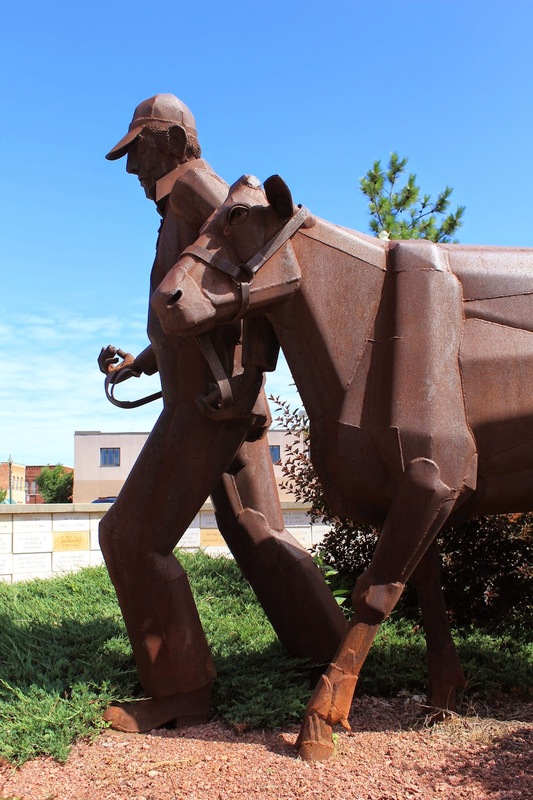 21st Century Genetics (now CRI / Genex) donated the dairy industry statue in 1990 to commemorate their 50th anniversary. Weber Veneer & Plywood, Timbco, Shawano Paper Mill and Tigerton Lumber Company donated the second sculpture, which depicts the area's logging history. Click here for more information. When I arrived at 10:00 a.m., the facility was closed. However, the grounds were open and I was able to walk around and photograph several of the buildings. I also located two From the Pineries to the Present historical markers. Click here to learn more. The primary address for this location is 524 North Franklin Street, Shawano 54166. The first marker (above) describes the mill at this location from 1843-1871. Click here to read more. The second marker (below) describes changes to the area between 1844 and 1950, and how "Sunset Island" came to be. Click here to read more. These markers are located a short distance from the Museum's primary location, on northbound North Franklin Street, just north of its intersection with West 1st Street, where North Franklin Street dead-ends at Sunset Island, on the grounds of Shawano County Heritage Park, Shawano 54166. Back onto North Main Street and headed to the next location on the tour, I noticed this piece of artillery. Click here to read more. The gun and marker are located on southbound North Main Street / Wisconsin Highway 47 / 55, just north of its intersection with West 3rd Street / North Sawyer Street, Shawano, Wisconsin 54166. These (above and below) are the quilt barns I could safely stop and photograph as I headed to the next location. Click here for a downloadable PDF list of the more than 250 quilt barns in Shawano County. This marker tells the origins of the Menominee People and the history of how they came to live at the present-day Menominee Reservation. Click here to read more. The marker is located on eastbound Wisconsin Highway 47 / 55 / Ben Warington Road, about a half mile east of its intersection with Strauss Road, at N7286 Wisconsin Highway 47, Shawano 54166. 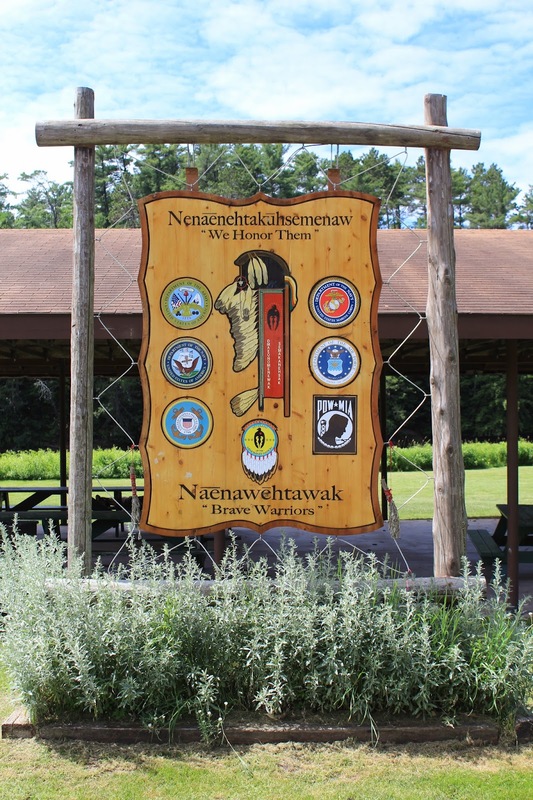 The tank is part of the Menominee Indian Veterans Memorial. Click here to read more. The M42A1 Duster is located on westbound Wisconsin Highway 47 / 55 / County Road VV, at its intersection with northbound Fairgrounds Road, Keshena 54135. I first visited this memorial in September 2012; it was only the three flags then. The memorial now includes marble monuments with the names of all Menominee who have served from the Civil War to present day. Click here for more information and photos. The memorial is located on westbound Wisconsin Highway 47 / 55 / County Road VV, between Lyons Road (to the east) and Fairgrounds Road (to the west), Keshena 54135. I visited my first logging museum only a few weeks ago (the Wabeno Logging Museum) and had really enjoyed the exhibits, so I was very much looking forward to this stop on the tour. Located on the Wild Wolf River, the Menominee Logging Camp Museum is the most extensive of its kind anywhere in the United States. There are seven log buildings, outdoor exhibits, and more than 20,000 artifacts, and warrants several hours to enjoy. Click here for more information. 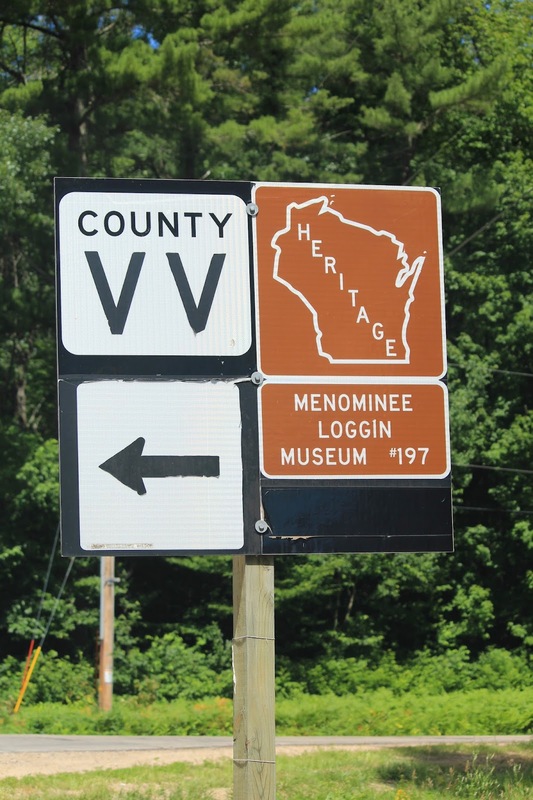 The museum is located on County Road VV, maybe 150 yards north of its intersection with Wisconsin Highway 47, Keshena 54135 (don't worry about the vague address; there's plenty of signage on Highway 47, and you can't miss the entrance once you're on County Road VV). This site is sacred, historical, and beautiful beyond description -- "a treasured place in the hearts of the Menominee." My photos do not do it justice. I'd been here before; I love this place! Click here to read more. Keshena Falls is located near a bridge crossing the Wolf River on BIA Route 300 / Keshena Falls Road, just west of its intersection with Wisconsin Highway 55, Keshena 54135. I visited this location in September 2012. You will add 15-30 minutes to your tour, but I think it's well worth it, especially during the fall when the leaves are in full color. 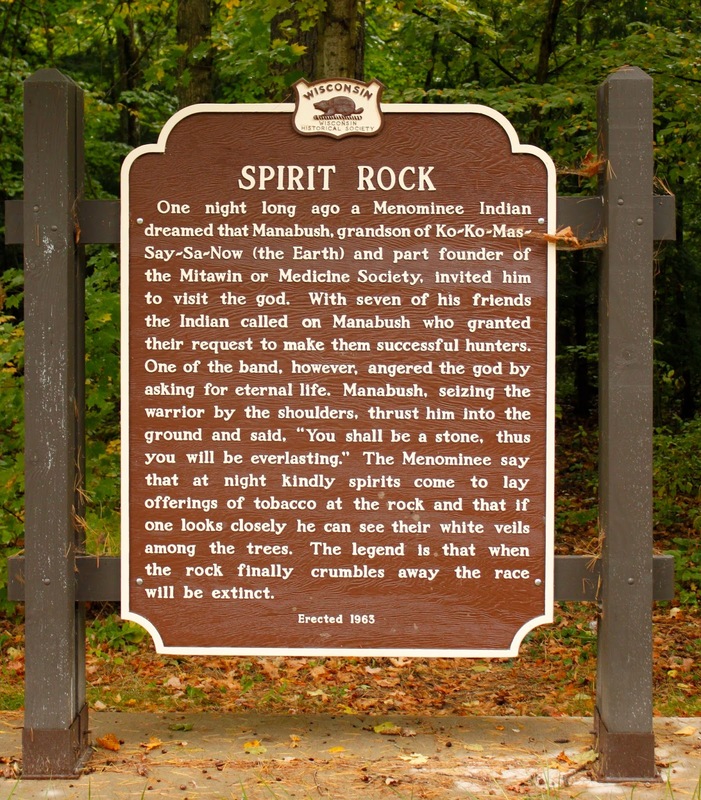 The marker relates a Menominee Indian legend that ends with "when the rock finally crumbles away the race will be extinct." Click here to read more. The marker is deep in the woods at a highway turnout on southbound Wisconsin Highway 55, 2.2 miles north of its intersection with Wisconsin Highway 47 / 55, Keshena, Wisconsin 54135. I collect Smokey the Bear signs. They've all but disappeared where I'm from in Southern California. They're everywhere in Wisconsin! I photograph every one I see; found two on this trip! This one's located on westbound Wisconsin Highway 47, just west of its intersection with County Road VV, at the entrance to the Hilary J. Waukau, Sr. Forestry and Environmental Resources Center, Keshena 54135. 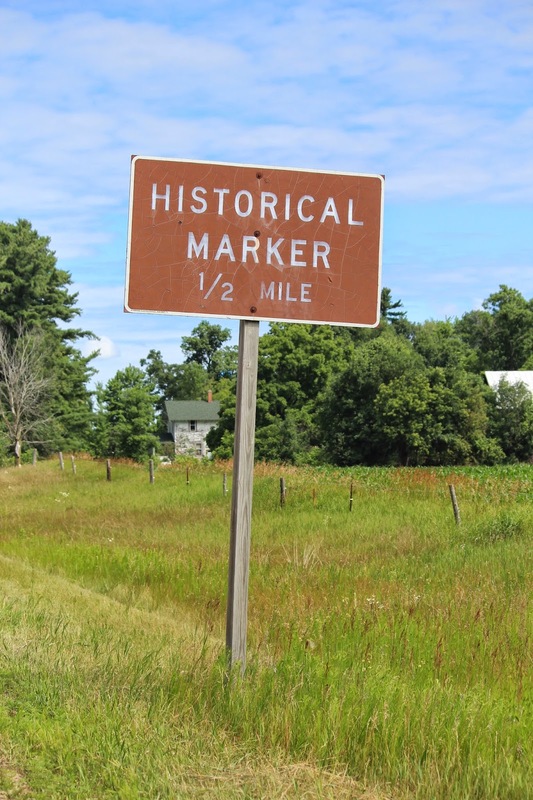 These markers tell the history of government tribal schooling and Christian spiritual teaching of the Stockbridge-Munsee Tribe from 1734 to 1933. These buildings were dedicated July 14, 1901, and were in service until 1922. Click here for The Lutheran Indian Mission marker. Click here for the The Lutheran Indian Mission School marker. The buildings and markers are located on County Road G, at its intersection with Meadow Lane, Gresham 54128. I'd blown through this town over a year ago and for whatever reason did not notice what I noticed on this trip -- all the colorful artwork, murals and displays! I don't usually do this because the focus of this website is Wisconsin's historical markers, but because of the nature of this From the Pineries to the Present tour, I gave Gresham its own link. There's a couple of quaint cafés, an ice cream shoppe, and a bursting-at-the-seams "Trading Post". Gresham's the perfect place for a coffee / soda, snack, or meal stop. Click here to check out all the photos of this lovely little town. I first visited this location in May 2013. I was touched (and surprised) to receive a comment on the post from Lillian Ferrall, granddaughter of Russ and Grace Farrall, the couple instrumental in restoring and preserving this Gresham gem. Click here to read more. The Gresham Depot Museum and marker are located at 1311 North Main Street, Gresham 54128. I have visited more than 400 veterans memorials throughout Wisconsin. This one is unique. It's the first I've seen that incorporates the spiritual tradition of the veterans' tribe. The memorial, the elaborately-carved dugout canoe, the pristine location . . . it was an honor to visit. Click here to learn more. 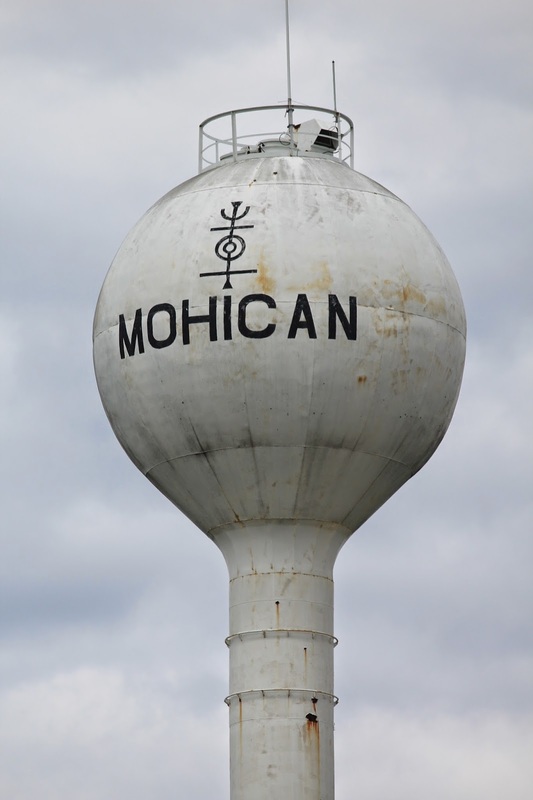 The memorial is located on westbound County Road A, at its intersection with Healing Way, at the Mohican Veterans Center, Bowler 54416. The eagle head at the head of the dugout canoe. View of the entire memorial from County Road A. The photo above and the next several photos below are en route from the Stockbridge-Munsee Community / Mohican Veterans Memorial to the Arvid E. Miller Stockbridge Munsee Historical Library Museum (the next stop on the tour). The logging industry still going strong in Shawano County! I was also looking forward to this stop. I have an interest in and deep respect for Native American culture and history (taught to me at a very early age by my father and my 1st grade through high school involvement in Camp Fire Girls). The Arvid E. Miller Stockbridge Historical Library Museum boasts "new exhibits, new acquisitions, tribal historical facts and tidbits, and old photographs", and a collection of "cultural and historical artifacts from pre-contact to the Mission school eras, including the Tribe's Bible on display". I stayed at the museum for about an hour; I could have stayed another couple more. Included in the museum's collection is a Purple Heart medal, awarded to one of the tribe members for service during World War I. I'd never seen a Purple Heart before; it was incredible. 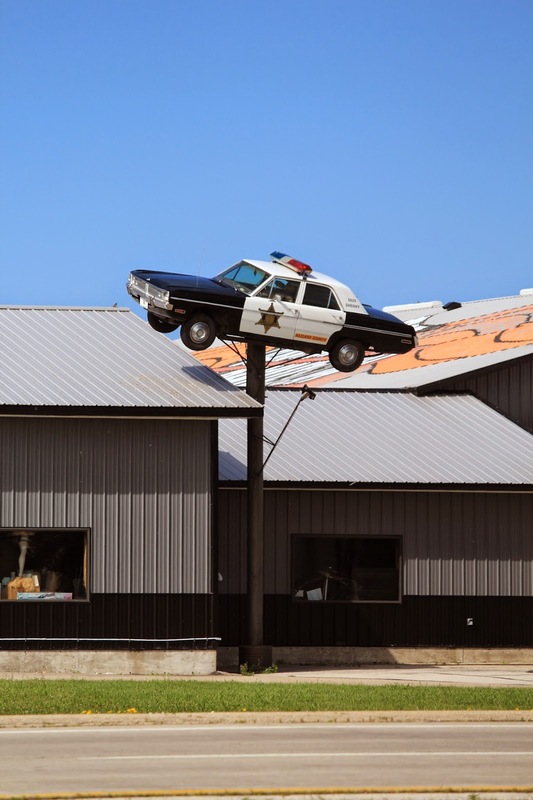 Click here to read more about the museum, then use the "Arvid E. Miller Stockbridge Munsee Historical Library Museum" label at the bottom of the post to tour the outdoor interpretative exhibits (there are several). The museum is located on Moh-He-Con-Nuck Road, two miles north of its intersection with County Road A, at N8510 Moh-He-Con-Nuck Road, Bowler 54416. Several of the outdoor interpretive exhibits (with historical markers) at the museum. This Smokey's located at the Stockbridge Munsee Public Safety building at W13445 Camp 14 Road, Bowler 54416. Once you've completed the tour, there are two ways to return to Highway 29. One is to travel from County A to County D, which will take you through Bowler and then to Tilleda and then to Highway 29. The other way (which I discovered completely "by accident") is to travel westbound on County A to where it intersects with southbound Hillside Drive (44.870132,-88.884855 / Google Map). Hillside Drive becomes Mill Creek Road. Turn right (west) when Mill Creek Road T-intersects with Roosevelt Road. Take Roosevelt Road to Airport Road and turn left (south). Airport Road takes you into Tilleda. This route into Tilleda takes you through beautiful countryside along a winding, narrow, two-lane road. The scenery is spectacular! However, if you go this route, you'll miss Bowler altogether! I drove both routes (because I got myself a little lost!) I enjoyed both drives. Choices! Choices! (the alternate (scenic) route to Tilleda). Southbound Mill Creek Road / Roosevelt Road, the back road leading to Tilleda. Arriving in Tilleda from Airport Road. Coming through Bowler en route to Tilleda on County Road D.
Bowler's history is intimately tied to the logging industry. (entered by the Bowler Logging Company). Click here to visit the Bowler Area Historical Society Facebook page. Very cool silos; just off County Road D, in Bowler. Looking east from southbound County Road D, on the outskirts of Tilleda. Timeline Saloon & BBQ is south of Shawano, on Highway 29. One of the displays at the Timeline Saloon & BBQ on southbound Highway 29. One last gorgeous quilt barn alongside Highway 29 . . .
Live outside of Gresham in an old schoolhouse. We have an awesome bell tower. We are right off the highway. To bad you didn't get pictures if it. Great pictures tho! Thanks, Sara, for stopping by and for your comments. Very sorry to have missed your schoolhouse -- I love those old buildings! If you contact me through wisconsinhistoricalmarkers@gmail.com, and send along a photo, I'll be very pleased to add it to the Stop No. 15: Gresham is Awesome post.